Greg: All right. I’m sitting here with Jason Black, and I think we have some introductions to do, so I’m going to go first, I’m Greg, this is going to be really short. I’m Greg, your host, but this is going to be about you. You have some news for us. Jason: Yes, so this is going to be the first episode of the Louisville custom home builder podcast. Jason: Yeah, I thought it would be a good way to give people a little bit deeper in-depth look as to what I do on a daily basis. Greg: You’ve been a custom home builder for years in Louisville, so take us back a few years. Tell us how you got involved in custom home building and why we’re doing this podcast and other projects going forward. Greg: Your decision, you were forced into a decision. Jason: I was forced into a decision. The company I was working for basically went out of business in Louisville and the company was moving to Kansas City. I didn’t want to move to Kansas City, so took a severance package, took some time off, because I couldn’t find a job, and really did some soul searching. It was at that time that I really decided that I want to be a custom home builder. Greg: This was your passion coming out. Jason: Yeah, so I’d always loved new houses, had always gone through houses growing up as a kid, was always fascinated by them. Never dawned on me that I could be the builder of these fine homes until I decided that I wanted to give it a shot. Jason: Yes, so, all in, it took me about three years, once I decided that I wanted to be a home builder. When I didn’t have a job, I didn’t have any money, so it was like, “What am I going to do?” I had to go find a job. Found a job at a local company, Fortune 500 company, doing accounting, budgeting, finance, what my background was. During that time, I started slowly. I built a house for myself. I built a house for my in-laws. Friends and family, anybody that would let me build them a house for free, basically, I would do it, and I was just looking to gain experience. That went on for a few years, and almost three years later, I had another job. I had about ten houses under wraps, or under construction, and that’s when it started to hit me that maybe I need to do this full time. Jason: Yes, so went full bore into home building. I had a partner at the time. We started the company; it was called Stonecroft Homes. We had a great run over the last ten years. We’ve built couple hundred homes all throughout Louisville, Norton Commons, Jefferson, Oldham, Shelby County. Greg: Well known, right? I mean, these are beautiful, large, luxury homes, a lot of them, that people have seen various Homeramas in various locations around town. Jason: Yeah, we have a great following. We’ve built several Homerama homes, we’ve built several show homes, several grand award-winning homes, great floor plans. I love building houses; it’s been a great outlet for me on my creativity side of things. Yeah, it’s been great. Greg: But it sounds like, maybe there’s a next step here, a next introduction for you to make. Jason: That’s right. As I left corporate America to start in a partnership in Stonecroft Homes, it was a great step for me. This podcast is a way for me to have another coming out party today, so to speak, with my new venture. Greg: All right, lay it on me. 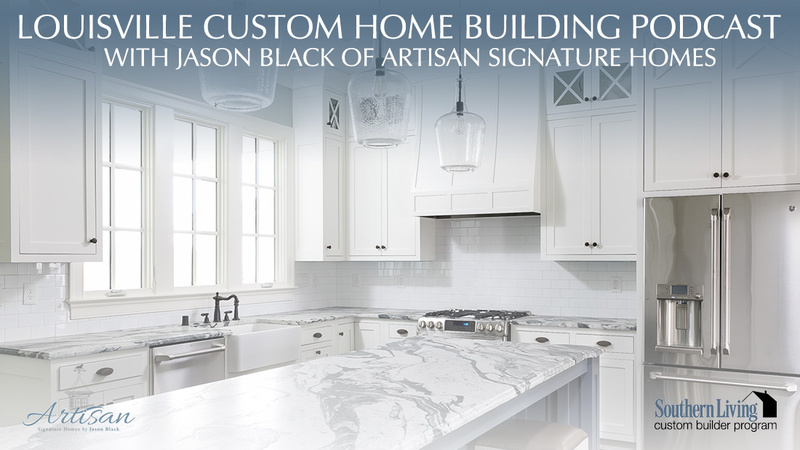 Jason: I’m leaving my previous company and starting a new business called Artisan Signature Homes. Greg: Now I am, having seen your work, I’m very anxious to see where this takes you. I know that you are fully engaged with people who like homes, and there are apparently lots of people who love your pictures, and videos and those kind of things. Are you going to keep teasing us with some of these beautiful pictures and some of the aspects of these homes? Jason: Absolutely. I plan to develop my Instagram account. We built a large following with the previous company and plan to do that again with Instagram, Twitter, Facebook, and really give people an in-depth look at the day-to-day life of a custom builder, what goes in to building a house, and then also the end result. We’re going to expand it a little bit with Artisan. We’re going to do a weekly podcast. We’re also going to do weekly videos. Some of the things we’ll do this year coming up is, we’ll let you follow the process of building a house from start to finish, what goes into planning, what goes into design, how you finance it, walk through the selection process, and then get to the finished product. We’ll have some podcasts on that. We’ll also have videos of each of those steps along the way. Greg: So this might turn into a nice resource for someone who is curious about the process. They want to get to know your work, your personality. They can follow along and learn as we go. Greg: But you won’t mind if I just follow along and look at the pictures, right? That’s okay too? Jason: We’ll have as many followers along the way, for sure. Jason: Yeah, we have some exciting projects. We’re going to be doing Homerama 2016 in Norton Commons. Next year, we’re also going to be doing a Southern Living showcase home. One of the things with Artisan is, we’ve affiliated ourselves with great companies. Southern Living is one that has hand selected our company as one of the top hundred builders in the South. Jason: We’ll be doing some specials with Southern Living as well along the way. Greg: Well this all sounds very exciting. I’m looking forward to it, and we will keep playing along and I’ll see you on the next one. Jason: Sounds good, Greg. We look forward to it.